It has been a long hard winter for the 815 region. After several months of indoor exercise, it is finally warm enough for us to ditch the treadmill or elliptical for the time being and head outdoors. 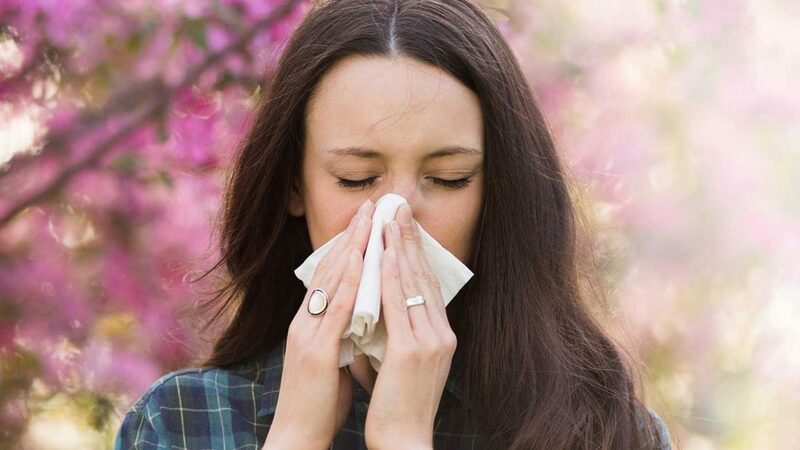 If you struggle with seasonal allergies, you don’t have to let that ruin your spring fever; get out and enjoy some outdoor exercise by making a few simple modifications and being prepared. According to the American Academy of Asthma, Allergies, & Immunology, seasonal allergies affect roughly 46 percent of the U.S. population. Symptoms may include sneezing, runny nose, nasal congestion, eye redness, and itching of the eyes or body. Allergens come into contact with the eyes, nasal passages, and airways, causing inflammation. Inflammation triggers the eyes to water and mucus production to increase in an effort to protect the tissues; this results in what we experience as allergy symptoms. Allergy seasons are predictable. In many areas of the United States, spring allergies begin in February and last until the early summer. Tree pollination begins earliest in the year, followed by grass pollination later in the spring and summer. Ragweed is typically the culprit in the late summer and fall. Mild winter temperatures can cause plants to pollinate early, and a rainy spring can also promote rapid plant growth and lead to an increase in mold, causing symptoms to last well into the fall. To avoid pollen, find out to which pollens you are sensitive and then check the pollen counts. Weather reports in newspapers, on the radio, and on television often include this information during allergy seasons. You can also check the pollen counts for your zip code or city at pollen.com. If the pollen counts are medium or high, you can head to FitMe Wellness or postpone your outdoor workout until pollen counts are lower. Depending on the season, pollen counts are generally highest between 5-10 AM and at dusk. In the spring and summer during tree and grass pollen season, levels are highest in the evening. In the late summer and early fall during ragweed pollen season, levels are highest in the morning. Unfortunately for our allergies, the pollen count is never zero. Before heading outdoors for a workout, you should consider the weather and intensity of your planned activity. On days that are warm, dry, and windy, allergens will be stirred up and widespread throughout the air; pollen and other particles are washed out of the air with the rain. The intensity of your activity can also have an effect on your allergy symptoms. Higher intensity activity causes you to breathe deeper and more rapidly; this exposes your airways to more allergens. On days with high pollen counts or that are dry and windy, you may want to consider lower intensity outdoor activities. Protecting the eyes and airways will help lessen exposure and allergy symptoms. Wearing wrap-around goggles will cover and protect the eyes from exposure and help prevent redness, itching, and watering of the eyes. You can protect your airway by wearing a bandana around your neck that you can pull up over the nose and mouth. You can also wear a mask; there are now ones available on the market that are more fashionable and designed for exercise. If you don’t want to make a fashion statement, a regular mask will work. Wearing a hat will prevent allergens from settling in your hair. Brimmed hats also provide additional protection for the eyes. Showering after outdoor activity and changes into clean clothes will help to wash away any allergens that are on your skin or in your hair. If you are unable to shower directly after your activity, you should at least try to change clothes. There are several over-the-counter oral anti-allergy medications available that can be safely used before outdoor activity. Most are non-drowsy and will not decrease your energy or cause dryness. There are intranasal corticosteroids available over-the-counter that will decrease inflammation and reduce symptoms. These typically need to be used for a full day before its benefits will be experienced. If none of these precautions improve your symptoms, you may want to consider a consultation with an allergist. Allergists can pinpoint your specific allergy triggers and prescribe more targeted medications. They can also make sure that you do not have a more serious respiratory condition. You should get clearance from your healthcare provider before exercising outdoors if your allergy symptoms are severe or cause asthma symptoms such as wheezing or shortness of breath.